It boasts its own flag, currency and even a football team. 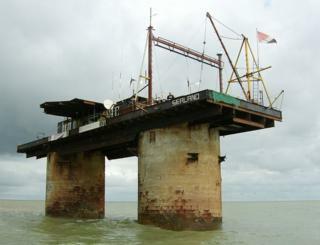 But unlike most other states, the principality of Sealand sits seven miles (11km) off the Suffolk shore atop a platform of concrete and iron. The fiefdom today marks 50 years since the pirate radio broadcaster Roy Bates first clambered on to it and declared it a sovereign state. To mark this half century, supporters from around the world are gathering for a dinner - not on the once abandoned fort, but in Leigh-on-Sea, in Essex. In the past 50 years, Sealand has fought off incursions from other illicit broadcasters, fired warning shots at the Royal Navy and suppressed an attempted coup by a group of German businessmen. Mr Bates, a father of three, said the micro-nation represented a "desire for freedom away from authority". He says it receives scores of citizenship applications each week from those "looking for something a bit different". Mr Bates, who lives in Leigh-on-Sea, said: "We have two people out there permanently - the most we've had is around 50 at one point. "It's a very, very interesting and different kind of life. Believe me, I've had a lot of adventure out of it." To survive financially, the rusting outpost has operated as offshore storage for electronic records and currently sells quasi-aristocratic and Sealand paraphernalia. Among its many title-holders, is the singer-song-writer Ed Sheeran, who is a Baron of Sealand. Sealand was originally HM Fort Roughs or Roughs Tower, one of four naval sea forts designed by Guy Maunsell for the British Royal Navy to defend key shipping lanes from German attack during World War Two. During the war, between 100 and 120 naval officers were stationed on the tower. On 2 September, 1967, when the late Mr Bates claimed the fort and declared himself ruler (and, on her birthday, his wife Joan princess) the fort outpost was beyond the three-mile (5km) British waters mark. Beyond the grasp of Whitehall, British forces responded by pulling down other forts to prevent other would-be state creators from following Mr Bates' lead. In 1968, a 14-year-old Michael Bates sent "warning shots" across the bow of a vessel he felt was sailing too close to the platform. When he and his father were hauled before the courts over the "swashbuckling incident", a judge concluded the law had no jurisdiction over the territory. The second came after a German diplomat was sent to negotiate the release of a hostage following a botched coup by German businessmen, who arrived by helicopter, in 1978. Michael Bates, who wrote a history of Sealand called Holding The Fort, added: "We're perhaps the most undemanding state in the world. "We don't force anybody to worship any god or religion or anything. "Maybe that's why we've lasted so long. "Hopefully I'll be around for the next 50."